Does your yard need raking? Maybe your garage needs cleaning; a fence needs painting, or your cars need waxing? 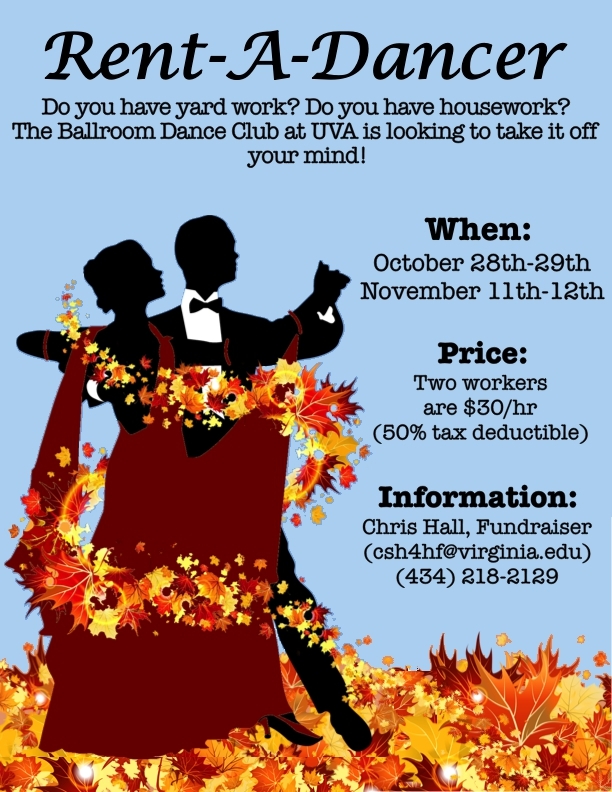 The members of the Ballroom Dance Club at UVa would like to do your yard work for you! We are starting up our semesterly Rent-A-Dancer fundraiser and need your help. Rent-A-Dancer is where members of the Charlottesville community can “rent” a pair of UVa ballroomers for a few hours on a specified weekend to do simple household/garden chores (i.e, raking leaves, spreading mulch, etc.) for only $30/hr for 2 dancers. Decide when and how long you would like us to come for between 9am and 5pm. Choose the date that best works for you: Saturday or Sunday on Oct. 28th, 29th, Nov. 11th or 12th. Reply to this email (csh4hf@virginia.edu) or call (434) 218-2129 (feel free to leave a message!) with all the pertinent info or any questions you have! You must remain on site, at your residence for the entire time the students are there. For payment, we accept cash or check, a receipt from the UVA Fund will be mailed to you following your payment. Here’s your bonus: Write off 50% of your donation as a tax deductible contribution! We hope you will choose to include us in your fall yardwork/housework schedule! Feel free to pass on this email to your friends or family in the area who may also be interested in supporting UVa’s classiest club sport!